Before, I have posted about creating a custom action helper. Now since I’m back for a ZF project, I’m posting how to create a view helper. My examples will be about rendering SELECT (dropdown menu) elements (without using Zend Form). I really hate Zend Form. That is why I’m creating HTML elements on the view. They performs way faster than having a form object with validators, filters, decorations, etc that slows things down. If only Zend Framework has something like Sprig in Kohana v3, that would be nice. But since there is none, I’ll do my form thing my own. On the other hand, If ever, I may create a port of Sprig for Zend Framework in the future, if time and eagerness is still up. Now let’s create our first helper. I want a view helper that will accept parameters to build a SELECT/dropdown HTML element, so that other helper may use them. So I’ll be calling them HtmlSelect. Create HtmlSelect.php on the view helpers directory. The class is so simple, it just need to extend Zend_View_Helper_Abstract so that it can also call other helpers (if you are sure it does not need other helper, you can skip the extend part). My HtmlSelect class has a single method htmlSelect that accepts parameters such as name, values, selected, attributes and other stuff. Your strategy may differ but in our system, there are specs that I cannot break even though they are against web standards. Anywhere in your ZF views, you can call this helper by $this->htmlSelect(). However, our class is still almost useless. So let’s create the actual helper. I need a helper that allows me to render TITLES such as Mr. and Mrs into a SELECT element. I’ll be calling the class PersonTitle. 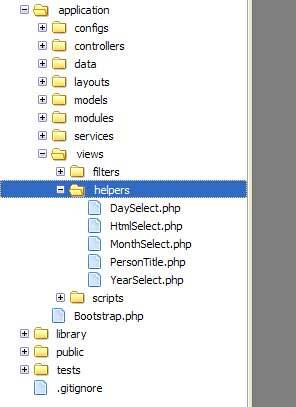 Add PersonTitle.php to the view helpers directory. In my project, I need more SELECT elements like day(1-31), months(Jan-Dec) and year to represent a date. Since that is the most keyboard friendly interface. So I’ll be calling them DaySelect.php, MonthSelect.php and YearSelect.php. As you’ve noticed, there is a parameter on htmlSelect that allows the SELECT to have the first option as empty option. It is invalid XHTML, however, our specs may need them (or shall we say, will always need them). Code for DaySelect.php – it simply renders options 1-31 representing the day of the month. 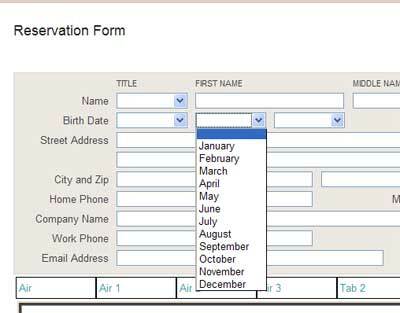 Code for MonthSelect.php – it renders the months Jan-Dec as options. And finally the code for YearSelect.php – renders the current year down to 100 years before the current. This is used to represent birth date as a whole. And the screenshot just to be sure. You need to code your CSS though. These all Zend Framework code is using ZF 1.9.2 and up using autoloading (the standard ZF structure). My Kohana posts are a bit delayed since most of my KO3 just works out of the way and there is no thrill / excitement that it does not give me motivation of writing posts about it. Zend Framework has always been so exciting. This entry was posted in Zend Framework and tagged view helper, zend framework helper, zend framework view helper, zf helper, zf view helper. Bookmark the permalink. I never thought of digging the Zend Form helpers. Thanks for reminding me of them. However, it seems that I only need to remove the htmlSelect part. Thanks again. Zend_View_Helper_FormSelect looks neat. Thank you so much, you saved my day! !